It happens a lot of time with all of us that sometimes when we find an open WiFi network and start using it, we realize that our mobile data is much faster than that WiFi network. So, we have to turn off the WiFi and then use the mobile data to get a good speed. But, what if you get to know that speed of any WiFi network before even connecting to it? Well, a new feature has been added to the Android 8.1 Oreo that lets the users see the network speed before they connect to an Open WiFi network. We all know that when we connect to WiFi network, the WiFi icon on the status bar shows how strong the connection is. If there is a fuller icon, this means a pretty strong connection and same is the case for a weak connection when the bar is not full. 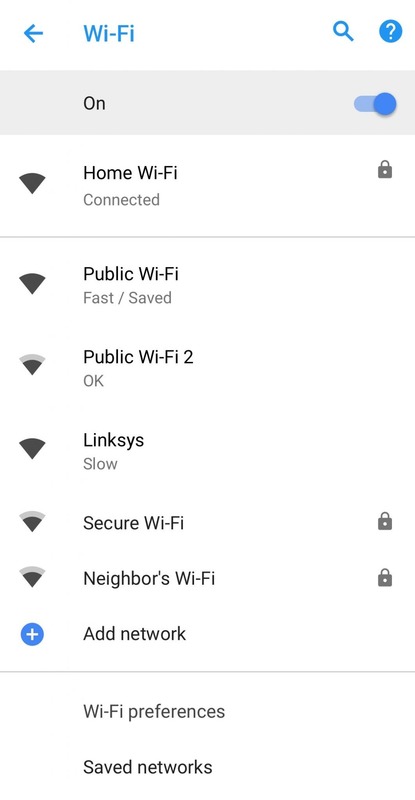 A new feature that has been added to the Android 8.1 Oreo shows you the speeds of the WiFi networks that are nearby you ( if they are open) so that you can connect if the speed is good enough. Slow (0 – 1 Mbps) – If you can use Wi-Fi calling, you can make phone calls and send texts. OK (1 Mbps – 5 Mbps) – You can read web pages, use social media, and stream music. Fast (5 Mbps – 20 Mbps) – You can stream most videos. Very Fast (20 Mbps+) – You can stream very high-quality videos. For Example, if you are shown ‘Slow,’ then this means the Open Wifi Network that you are going to connect to has a speed of 0-1Mbps. Well, this is a pretty sweet feature, right?